Thrillers written from the perspective of especially created characters are many. But when two organizations are involved in a showdown it's an all out war. 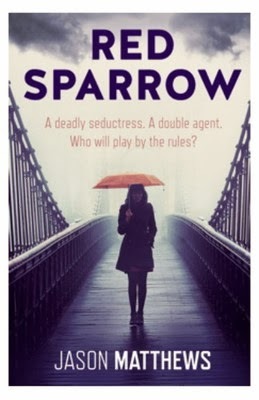 Author Jason Matthews in his book "Red Sparrow" tries to gives the readers a difference bit unique and different from what other books have to offer in this genre. So has he delivered the goods? Let's find out. A Russian honey trap agent targets a young CIA operative to uncover a seniorranking mole at the heart of the Russian Intelligence service. Dominika Egorov, former prima ballerina, is sucked into the heart of Putin's Russia, the country she loved, and spat out as the twists and turns of betrayal and counter-betrayal unravel. First look at the title and the cover and it will ask a lot of questions. A mysterious agent with an umbrella on a fogged bridge has a lot to say about the story line. The title is also intriguing and quite a title which can be related to something a thriller. The blurb talks about two people and how their lives are going to get entwined and what will happen after that. It is not a clear indicator and that makes the readers uncomfortable as what to expect from the story but keeps the spirit of the book alive. The story is of a CIA agent Nate Nash and ballerina turned sparrow Russian agent Dominika Egorova. When Nash is packed off to Helsinki after a huge blunder Russia takes help of General Egorov who in turn recruits Dominika, trains her and makes her ready for a showdown with CIA. When their paths cross a lot is on the line for both the countries as everything from lives to secrets to national integrity is on stake. So will Dominika be able to deliver the goods? Will Nash be able to decipher the real motive behind the whole setup? What has fate planned for both of them in the end? That's what the story is all about. There's a lot of action and political drama and mystery being poured into the story. The CIA & SVR face-off creates a lot of exciting moments. The book has a lot of edginess and blunt narration and a lot of technicalities which has been written with a lot of flair and a very good approach. The two agent face-off is also a noteworthy thing happening in the story. The first half has more excitement in it and keeps the readers busy with action packed sequences and blink and miss events. The downside of the book is it's predictability and average end to the story. The importance of the agents has been cut down a lot in the second half which takes the charm away from the book. The end could have been polished a lot better. All in all the story has entertainment, operatives, missions, ruthlessness and action packed drama involved in it. The story takes off with a lot of guts and glory but falters time and again after that and the flat out ending leaves a lot to imagination. The book doesn't lives up to the expectations but has the goods to make it exciting for the readers.